Overview: Pan Am is a historic airline that, for a time, defined the adventure and luxury of travel. With those ideas in mind, I designed a revival of Pan Am for our contemporary moment. Based on user research, I designed a mobile iOS application and new branding assets that could help travelers find new destinations and book travel more easily. I began by conducting user research with people of varying demographics and travel experience. I also conducted a short survey to learn more about people's travel habits and expectations. I learned that the most frustrating parts of booking travel are cost, booking for more than one person, and seeing all of the options available before committing. I also learned that there is a lack of trust in booking travel on a mobile site or application, and many users turn to their computers to complete their purchase. Finally, when booking trips for fun (vs to visit family or for work), people are looking for a sense of novelty and adventure. From this research, I developed three personas: Frida the Frequent Traveler, Dan the Dad, and Wanda the Worker. With knowledge of the people I was designing for, I conducted competitor research to learn more about how other companies approach the booking of travel. I noted common elements, lacking elements, usability issues, visual design, and overall features. I also conducted secondary research on the travel market overall such as economic fluctuations and demographics of travel. In order to align user and business goals and needs, I created a diagram to illustrate distinct goals as well as overlapping goals. Keeping the personas of Frida, Dan, and Wanda close, I developed a UX Strategy Blueprint for Pan Am's Revival. This Blueprint offers an overview of my strategy to guide the process and prioritize design and development. Now that the product was starting to take shape theoretically, I put together a user flow and application map for an MVP (minimally viable product) version of Pan Am's mobile application. This serves as the foundation for how the user experiences their movement through the travel finding and booking process. I focused on finding and booking travel since these were some of the main pain points identified in user research. Wireframes are a fast way to put pen(cil) to paper and begin to visualize what the application will look like. I sketched out wireframes - first on paper and then digitally - and iterated on the ideas. I prepared digitally wireframe screens to test with users before moving on to hi fidelity mockups and prototyping in order to gather feedback early in the process. The wireframes show a booking page focused on Deals & Destinations because I had learned that users like to travel and also save money. I included designs for city pages with large images so that users could see the kind of destination they may be traveling to. After testing these designs with users I learned that when they are looking for deals, they don't really know what they are looking for - they are browsing. They way I had originally designed it was not appealing to them as a way to find destinations. However, they responded positively to the large image on the city page. I inquired about how they consider traveling to new places and they shared that it had to do with cost and what kinds of activities the location offered or what kind of place it was overall. For example, a beach or an urban foodie spot. I took that feedback and redesigned the layout of the pages to focus on location type as the main browsing feature. Users still have the option to enter a specific location. The new design incorporates more photosgraphs too. The identity of the new Pan Am is classic but of our contemporary moment. The new Pan Am celebrates its history of being a first in the technology of travel by continuing to bring new ideas into travel. The colors and gradients are bold and reflective of travel tags and the vintage travel posters Pan Am used to use in their marketing materials. The logo is a new take on the old logo. I included the globe shape but updated and simplified the font and removed the wings. The photography used on the site would be bold and adventurous; celebrating travel and people. I created a prototype to show some of the flow through the application. I used this to test the app, its design, and flow. 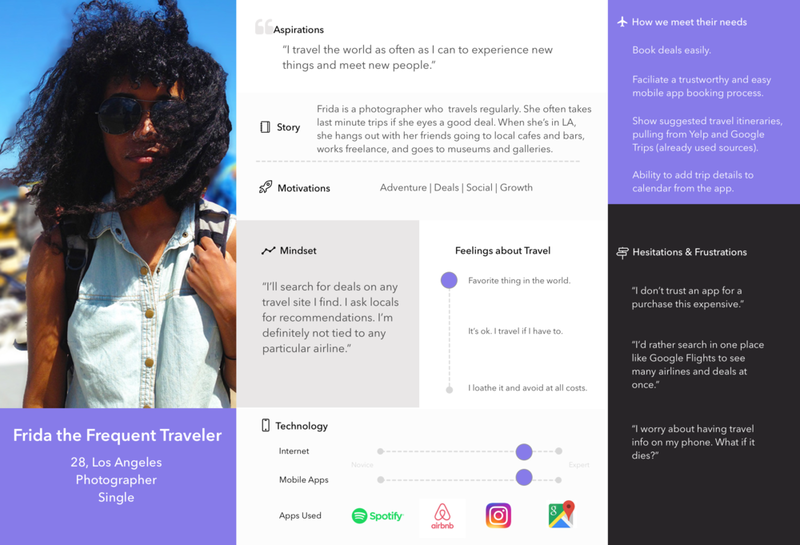 I learned that travelers liked starting off their experience in the application with minimal text and a bold image. This created a sense of adventure and minimized choice at the beginning of a sometimes overwhelming booking process. I iterated on the stepper in the design to include a plane icon that guides people through the process. The price slider seemed familiar to most testers from their other digital experience. The activity and destination selectors worked fairly well, but would need additional testing once real cities and data are added. (c) Lara (Stein) Kirby Pardo 2003 - 2019, unless otherwise noted. Want to get in touch? Send me a message.